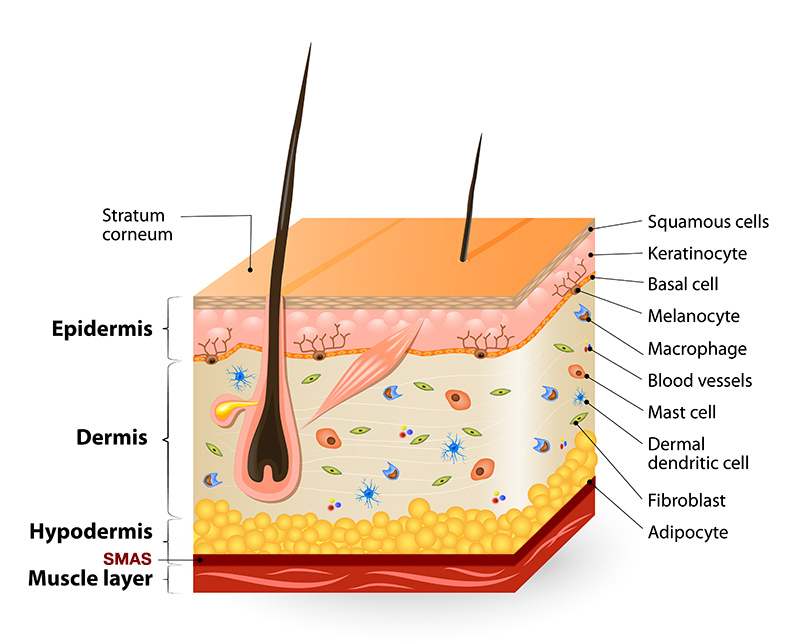 Apart from being the largest organ in the body, skin is also responsible for preventing bacteria, covering organs in the body, maintaining body temperature, acting as sensory receptors, and all the way to preventing water loss to keep the skin hydrated. However, once we get older, our skin that was once smooth and firm will gradually become loose, with the appearance of fine lines and wrinkles. 1. Epidermis is 0.7 mm in depth. It is the outermost layer of the skin that is responsible for protecting the skin from external factors, such as sun light. 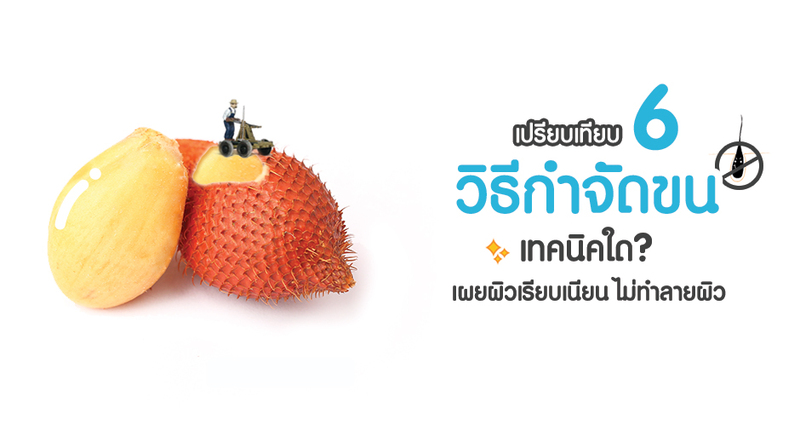 Its main function is to exfoliate dead cells, which then become scurf on the skin. It comprises of 4 semi layers that include basal, spinuous, granular, stratum corneum layers. 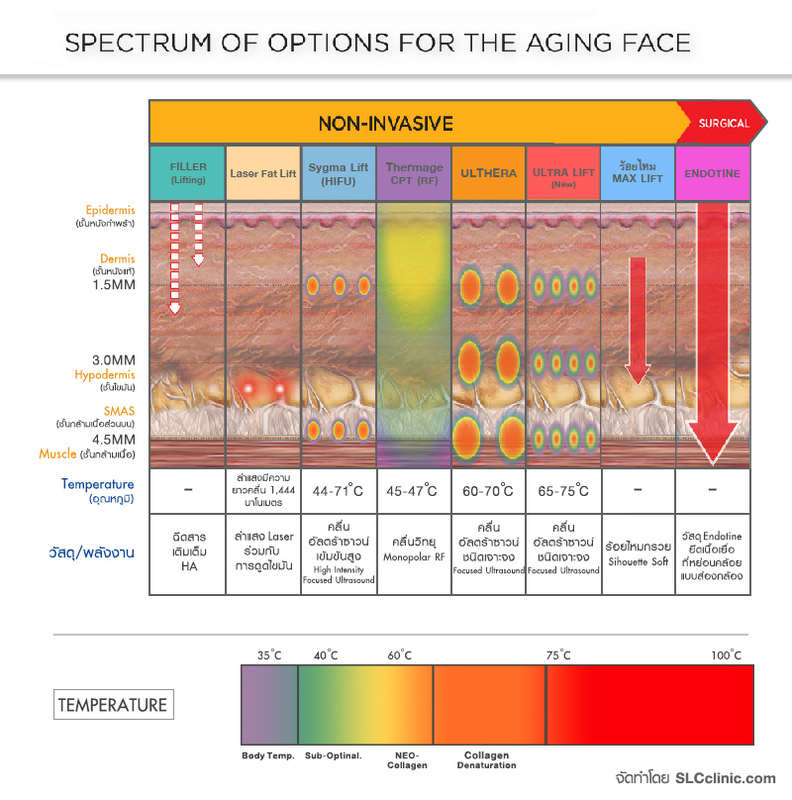 The skin cells will move from the bottom most layer to the upper most layer, where they will be eventually exfoliated. This cycle takes about 30-40 days. If the skin cells become atrophic, there may be the appearance of fine lines and the skin may become dry. This is the layer of skin that is commonly treated by applying nourishing cream. 2. Dermis is 1.5 mm. in depth. This layer of skin is the thickest of all the layers. It consists of collagen, elastin, fat, blood vessels, and oxygen that nourish the skin. Once we get older, along with the exposure to pollution, these components will vanish with age and with slower rate of reproduction, resulting in the appearance of wrinkles that cannot be covered with any cosmetics or treated with any cream. 3. Hypodermis is 3.0mm in depth. This layer comprises of fats and protein, specifically collagen. It is responsible for maintaining the body temperature, storing energy, keeping the skin in shape, and absorbing shocks for inner skin layer. It is the skin layer that determines the shape of the body, whether fat or thin. 4. SMAS is 4.5 mm. in depth. SMAS Superficial Musculo Aponeurotic System is the skin layer that is deeper than the collagen layer. Its structure comprises of connective tissues covering the thick and tough muscles. 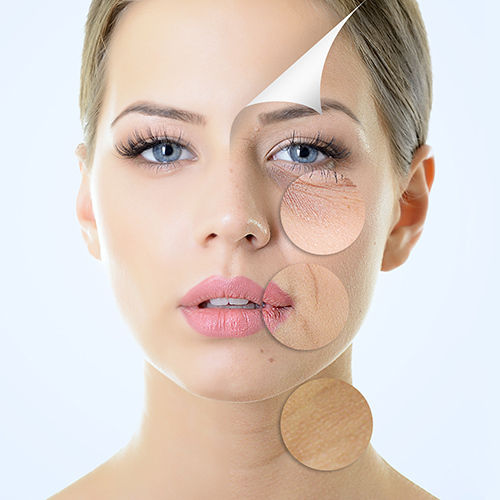 Once we get older, our skin will become loose according to the earth’s gravity and it is the main factor that causes wrinkles and fine lines. This skin layer is significant to the facelift surgery that will treat all skin layers and firm the fat layer underneath the skin. 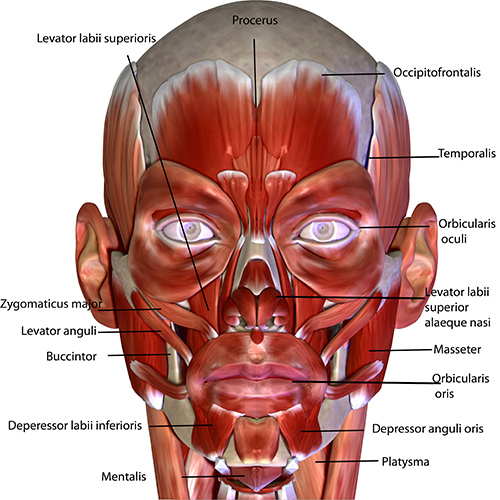 Muscle of Facial Expression includes frontails, nasalis, corrugator, orbicularis oculi, zygomaticus major, orbicularis oris, and risorius. Frequent facial expressions will result in continuous muscle movement, which may lead to the premature aging of your face, such as wrinkles or fine lines. Muscle of Mastication includes tempolaris muscle, masseter muscle, and pterygoid muscle. It is responsible for contracting, relaxing, and moving the masseter frontally. When chewing hard food, these muscles will become stronger and larger. 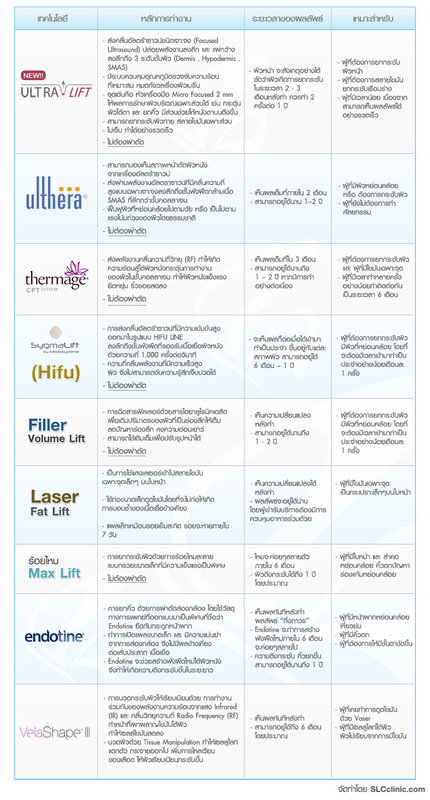 The treatment for loose and saggy skin with medical techniques to safely return the skin to its normal conditions with firmness and youthfulness must be under the consideration of a medical specialist and depends on the skin problems of each individual. 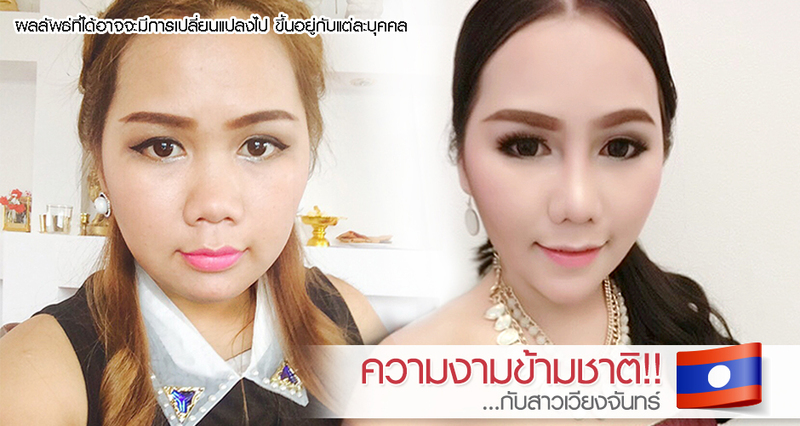 Revolutionize herself to stop the aging process – how did she obtain a youthful complexion? Let’s find out!